Summer is almost over and while the weather changes you find yourself using the pool less and less until the weather moves back into summer again. Although it is enjoyed more throughout the year in California than in other states, there are still months that the pool is not used, during those months you must still make having a clean pool the number one priority all year long. There are many things that could go wrong with the water as well as with the equipment. Thus, the people you trust with its maintenance are as important a concern as the frequency of your employment of pool cleaning services. 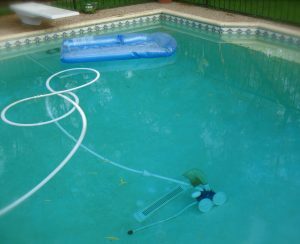 Pool Water Treatment Advisory Group listed common problems encountered (the pH levels, pool floor and walls issues, damage on equipment, and the water’s odor) along with the solutions that only the licensed pool professional can perform properly. The people you hire must be qualified and it is your duty to confirm that. Moreover, know what to inspect when assessing the services you paid for. When hired, pool cleaning service professionals become responsible for the upkeep of your swimming pool. Their services must range from maintenance to pool equipment repair, ability to offer assistance no matter what the degree of your problem is. Employing an unlicensed pool professional does not only mean less business for the people who are trained for that particular job, but also higher possibility of diminishing the number of pool cleaning professionals in the market. Because a pool costs a lot when not maintained, it only makes sense to protect your investment. If your goal is to keep your pool in good condition for many years, take care of it. Licensed pool cleaning service professionals know what to look for, detecting problems before they get worse and burn a hole in your pocket. If you plan to sell your house later on, be aware that the condition of the pool significantly increases (or decreases) the value of the property. Aside from the monetary concerns, ensuring that the pool cleaning service professional you consider or hire are licensed guarantees sanitation. The ones you hire for this task are, in a way, entrusted with your family’s safety, because their expertise determines your loved one’s level of exposure to health risks. Moreover, licensed professionals are sure to give you the best swimming experience possible. They are able to balance the water perfectly every time, without having to do guesswork on the chemicals. Only licensed professionals can make sure of that.